So, just two days after Daniel was discharged from Tallaght children’s hospital, he continued to get worse. Tuesday morning arrived and he had another high temperature and was off his bottles again. That afternoon he had been bearing down a lot as well as holding his breath. His hands & feet were also turning a funny greyish blue any time he did this. That was it, he was bundled into the car and I drove him to Tallaght A&E. Whilst on the road to the hospital I would put my hand back and rest it on his chest every few minutes to make sure he was breathing ok, at one stage just past Dundrum on the M50 I put my hand back and he was cold to the touch (despite the heating being on) so I immediately pulled in on the hard shoulder and ran around to the other side of the car to check he was ok. Thankfully he was still breathing but his breaths were shallow and fast. At this stage, the only thing on my mind was getting him to the A&E as quickly as possible. I got back in the car, put the headlights on full, the hazard lights flashing and floored it. I can hand on heart say that I broke most of the driving rules this country has to offer. Amazing that despite the fact I had my hazards on & lights in broad daylight, that so many people were so quick to gesture nastily at me and honk their horns when I drove all the way up the bus corridor on the road to the hospital. I wonder did they stop to think afterwards and put two and two together. Anyway, I apologise if I hurt anyone’s feelings on the road that day, but I won’t apologise for getting my son to A&E nearly 40 minutes faster than the fastest ambulance. Arriving at Tallaght A&E, Daniel was put on oxygen as soon as the attending doctor had examined him. Funnily enough the doctors name was Dr Daniel, ‘Ah three of us’ I said jokingly which put a big smile on his face while he put the cannula needle into Daniel’s tiny hand to draw blood and leave way for an iv drip. After the examination, Daniel was quite distressed and was doing a fair amount of kicking and screaming. My own head was now pumping sweat down my face from the heat of the A&E department but also because my upper back and right shoulder was coated in red tiger balm as I had put my shoulder/neck out that weekend. Several nurses came in to the curtained off room that we were in, I got the distinct impression that they were thinking I was incapable of settling my child. They tried all kinds of tactics like shaking & waving his toys in his face, making clicking noises with their mouths etc… despite me telling them that all he wanted to do was to sleep. At one point I was very close to telling them all the F*** off and letting them know that I’m not a first time rookie dad who doesn’t know how to settle a baby. I asked them to switch off the overhead lights and sure enough, all Daniel wanted was to go to sleep, he put up a little bit more of a fight and eventually fell asleep in my arms as expected. Sometimes it really pisses me off being a capable parent. There seems to be this giant assumption that all dad’s are useless and only mothers know better. I won’t disagree that this is often very true and that his own mothers touch would have had him sleeping quicker than I was able to, but I am far from incapable and I know one thing better than most, I know my own kids! Mean while, Ciara was waiting on her mother to arrive at the house so that she could make her way into the hospital. I think I got the better deal out of the evening as the stress of not knowing what is wrong with your baby and more importantly not having instant access and a steady flow of updates must be very scary. Soon as Daniel was settled I was able to start firing off the text messages with updates to hopefully ease the stress levels for Ciara. Daniel had only been sleeping for 20 minutes when one of the nurses came in to let me know that they had a room ready for him on the ward and that she had called for a porter. She busily set about transferring his oxygen line from the station wall to a tank under the hospital bed and raising the sides of the bed to make it safe for his transfer. Then she set about doing all the stats checks on Daniel to make sure his oxygen levels had gone back up and settled in the high 90’s. At this stage Daniel woke again and began screaming the place down. So now he is back in my arms and I’m trying to settle him when the porter arrives and proceeds to tell the nurse (loudly) ‘I’m not pushing that bed up with a screaming baby on it, have you no respect for my back. Sure the baby is awake and screaming, that will give people nightmares’. This went on for a few minutes until he convinced her that it would be better if I sat with Daniel in a wheelchair. I thought to myself, more fool you pal, now you have to push the babies 17 stone father up to the ward. Another bloody overpaid idiot! Off we went in the wheelchair, the corridor of the children’s A&E was littered with hospital beds, all of them had adults lying on them. I don’t get that as the hospital never seems to be busy or crowded with people. 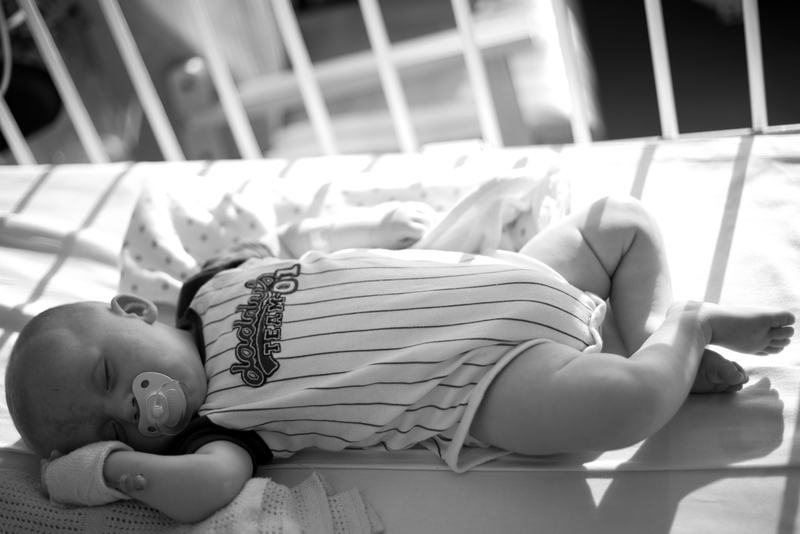 We arrived on the ward and transferred Daniel into one of the hospital cots. I didn’t see or hear from anyone for a good hour as the staff were busy doing their rounds. The doctor came in and examined Daniel, checked his stats etc… and then suggested he be put on the nebuliser for 15 minutes to help his breathing. 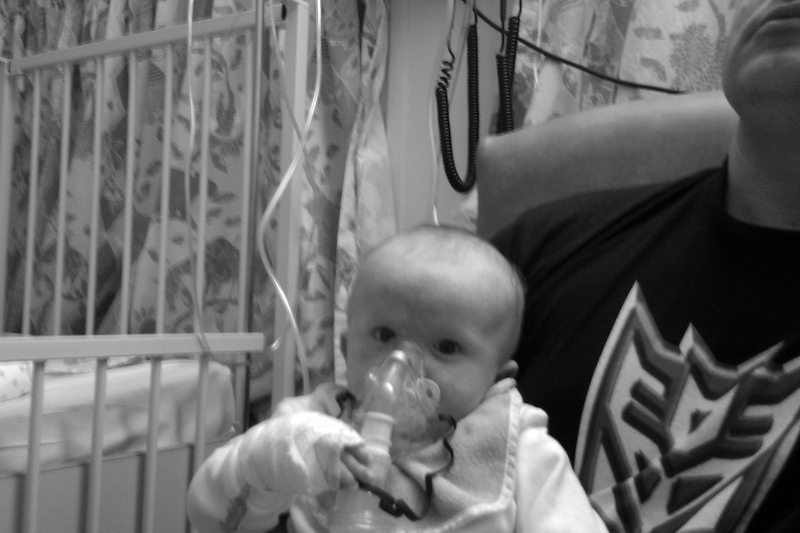 So along with getting a 1 litre per hour oxygen feed, he was now getting a 15 minutes burst on the nebuliser. I was very happy with this. Ciara arrived shortly after and was all prepared to stay the night. It was gone midnight by the time I left for home, stopping off at McDonald’s for a bite to eat. So unhealthy of me, but I was starving at this stage. For the next couple of days we rotated our time between the home & hospital. Ciara stayed in again Wednesday & Thursday night. My mother in-law stayed at night time to watch the girls while we were in hospital and to help me with them in the mornings which made the school & playschool runs go a lot smoother. 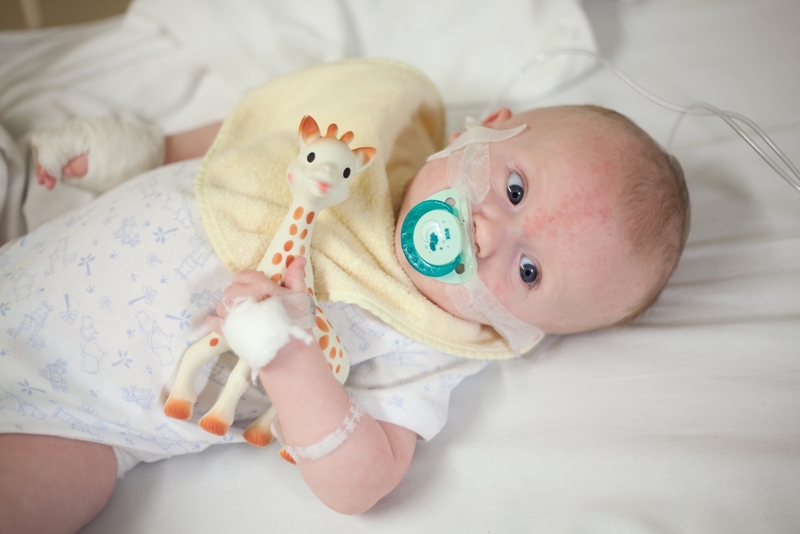 Daniel started to show signs of improvement on Friday and was finally taken off the oxygen. The doctor then said that if he could stay off the oxygen for the next 12 hours that he should be able to go home. 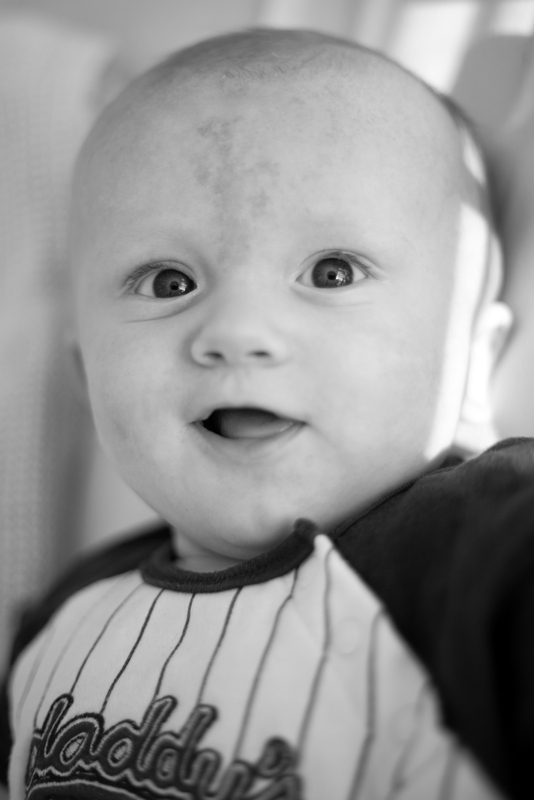 All that day he gradually made little improvements, he started feeding more and was a lot more like his usual smiley happy baby self. He was still able to take the nebuliser which now he was a real pro at using. I stayed the night on Friday night, stocked up with my laptop & some tv episodes to catch up on, I was fully expecting to be woken every hour, Daniel slept from 2am right through until 7:30am so I got a great sleep. I made a couple of trips to the kitchen to make cups of tea during the night. Every time I went to the kitchen, there were mothers either making cups of tea of making up bottles for their babies. 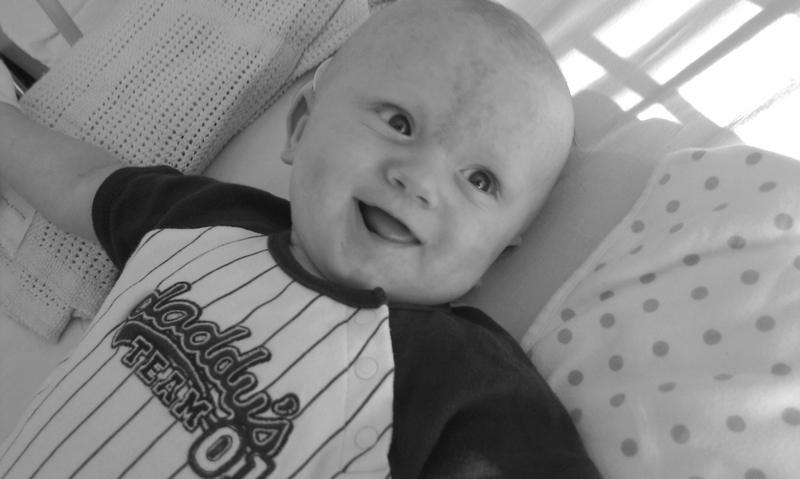 All of their babies had the same virus as Daniel, one of them just 3 weeks old. One of the mum’s had not left the ward since the Tuesday and she looked exhausted. Her husband was at home minding her other 3 kids which she was missing terribly, I had no words of comfort to offer her only that I hoped her little girl got better soon. This dose of Bronchiolitis was doing the rounds, Crumlin, Temple Street and Tallaght wards all had children suffering from the same thing. Five of the babies on the same ward as us had been admitted for Bronchiolitis. The next morning the doctor came round to the room at about 10am and after checking the charts and his latest stats, she gave me the news I was longing for. You can take him home later on this morning. I was relieved & delighted and couldn’t wait to tell Ciara the good news. Wonder will they let me go home today? I should take a minute to say a big THANKS to the wonderful nurses on the Maple ward in Tallaght hospital, they really do go the extra mile to make sure your child has the best of care. A good sign to me is that Daniel always greeted the nurses with a big dimple filled smile and always seemed to perk up when they came in to check his stats. The pictures in this post are a mixture of my camera with the 50mm lens or my HTC camera phone. All taken under natural light from two large windows in the room. My thanks also go out to the large & vibrant community of online photographers who have done a sterling job of keeping me cheerful with their tweets of kind words & encouragement. Dan sorry to hear about all the terrifying incidents surrounding your boy of late. He couldn’t have a better dad to get him to the hospital quickly. Hopefully this will be the one and only event like this for a very very long time. 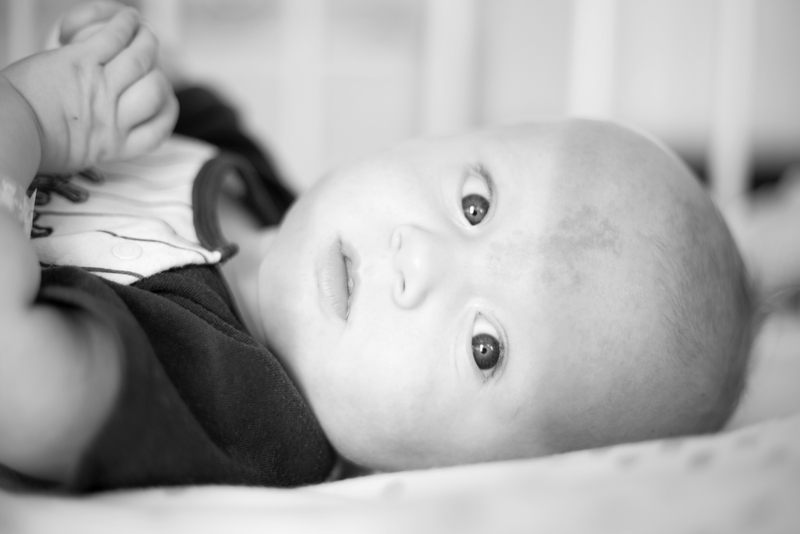 Super blog post, really well written with great photographs, but the best bit is that Daniel is home! My heart was beating fast just reading about your drive to the hospital. I’ve been there and the fear is like nothing else. I’m so glad little Daniel is better and home! What an accurate account of your ordeal, what a relief to read all turned out okay. Be well and happy! Superbly written and a great account of the ordeal to have for little Daniel when he grows up. Glad everything is coming together for you. Great blog mate and very well written, sad news but it was an interesting read and the way you tie the photos to the story is great. Jnr looks great – yet another cute baby to the family 🙂 Good genes as me ma always says!